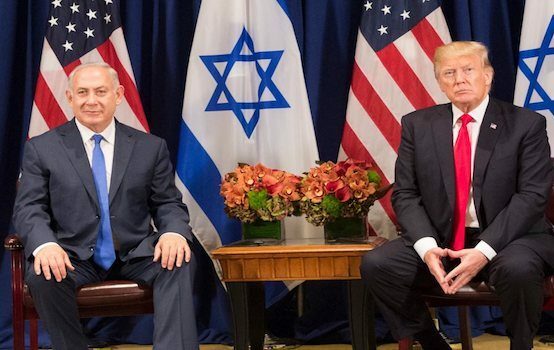 Now that the euphoria surrounding the United States moving its embassy from Tel Aviv to Jerusalem has passed, we are beginning to learn the price that will be paid for US President Donald Trump’s so-called “deal of the century”, his vision of a US-brokered peace agreement between Israel and the PA (Palestinian Authority). When the embassy was moved it was rumored that Israel will have to pay handsomely for the US gesture, moving its embassy. According to a News13 report on Wednesday evening, quoting a source who was present during the briefing in Washington, the PA will be receiving control of 85-90% of Yehuda and Shomron as part of its Palestinian state, as well as a portion of a divided Jerusalem. There will be a land exchange as Israel is going to annex certain areas of Yehuda and Shomron, but the details of such a land exchange is yet to be revealed. Despite empowered statements following the opening of the new US Embassy in Jerusalem and the undivided capital of Jerusalem will never be divided again, Trump’s plan reportedly calls for East Jerusalem to serve as the capital of the Palestinian state. However, sovereignty over the Old City and immediate surroundings remain in Israel’s hands. Regarding the Kosel and Har Habayis; Israel, the PA, Jordan and possibly other nations would administer the areas together. According to the report, the large communities in those areas will be annexed while the “settlement outposts deemed illegal by Israeli law” will be removed. For example, northern Shomron yishuvim including Yitzhar and Itamar would not be removed, but no additional construction will be permitted with the understanding they will be forced to “dry up”. In light of statements from PA leaders that they will reject any plan put forward by the PA, the White House expects that this will be the case here, while Israel will accept the plan. This plan offers the PA less land than they were offered by former Prime Minister Ehud Olmert, and that plan was rejected too as according to the Olmert formula, Israel would only maintain control of 6.3% of Yehuda and Shomron in addition to Israel relinquishing control of other areas to make up for 5-8% of Yehuda and Shomron. Regarding holy sites, the Kosel and Har Habayis, Olmert spoke of international control of those areas. For Naftali Bennet and his New Right party, the news could not have come at a better time as the various parties have begun campaigning for Knesset elections scheduled for April 9, 2019. Bennet will now campaign how a Likud-led government would result in the establishment of the State of Palestine, which entails the division of Jerusalem. The situation may also help the ailing Bayit Yehudi party, which according to an evening news report on Wednesday, failed to enter Knesset as it failed to garnish sufficient votes to pass the minimum threshold. How wonderful this plan is…we should be dancing for joy…And I was going to vote for Trump. Well he just lost my vote. מוחל טובות the embassy move. Who cares! The Israelis are too reliant on the US, they need to untangle themselves from the US and not involve them all the time even if they won’t have their vote in the UN ( and it would be better for the Israelis to quit the UN too). Relax, philosopher. Arabs will reject this sight unseen. They rejected the 90-95% by Barak, Rabin and Olmert, and same here. Don’t jump the gun, it’s not happening so fast.. This week ‘s parsha.. Vayechazak Hashem es lev Pahroh.. This plan is stillborn. ” A toiten bankess..( A dead bloodcupping procedure). MY COMMENT BETTER NOT BE CENSORED FROM THIS SITE OR YOU WILL GET A LAWSUIT IN YOUR LAP…. Moderators Note: YWN censured the entire comment for no other reason but to just to get the lawsuit. Please send it our way! philosopher…. Nothing in this article is true… this was tried yesterday and Greenbatt made it very clear to the media that none of this information on the Peace Plan has been revealed to any news source and that includes these lying fake news pieces of garbage The Yeshiva World News…. They are lying and have no proof to any of this information. Wow! This is some heavy price to pay for having the US embassy in Jerusalem! What’s the point f the embassy if the city will be divided? Take your embassy back, noone needs it. How is this any different then the plan under Ehud Barak in 1999 or so? At that time; I recall posters all over Jerusalem showing the dangers of having Palestinians in control of any part of Jerusalem and how they’d be able to target people at the Kosel with gunfire etc? Is the Kosel now going to become like Kiryas Arba??? Trump is brilliant. PA will reject this as they did when Olmert offered them more. Trump will claim he made a peace overture. This will work out fine. Please vote for him. my sanity, my religion is on the line if you do not vote for trump in 2020. The WH denies the accuracy of this report. Nothing about the plan has been released yet, and the media in Israel suffers from the same problem of Fake News as does the media in US. It would be prudent for reports to be spread around once there has been some credibility attached to them. Otherwise, the tendency to base public opinion on “unnamed sources” anywhere is simply fantasy gone wild. We watched the fake dossier financed by Hillary y”sh become the basis for senseless and baseless bashing. Had we waited for facts, there would be a more responsible political climate. The pediatric traits of today’s media would benefit much from some maturity. proudjewishamerican, ok, ok. If your sanity and and your religion hinges on my vote then I’ll vote for him. I don’t want you to go OTD because of me. It is amazing-just amazing- how the Trump zombies will swallow anything and everything that their idol says. This was said ages ago that Trump would exact a heavy price for the puny Embassy move. Yeah- a so-called great friend of Israel just stabbed us in the back and in the front. What else is new, The instigator of this “fantastic deal’ hasn’t made a good deal in his life, unless it is to stiff people who owe him money, Bibi made a terrible mistake cozying up to his master. Now he will pay the price at the election. Go Bennet-go Bayis jehudi. Moderators Note: Come on. Sue us. Don’t bully and threaten and then back down. Whether the arabs accept it or not, probably won’t, is not the point. From the outline, obviously not 100% accurate and complete, it’s simple to see trump’s intention here. He’s not the great friend of Israel you supporters thought he was. No surprise there. I quote a Gadol saying: ‘Rabosai, It’s not them, it’s us’. This is only HaShem showing who is in control as he awaits our return to Torah. Rabbiofberlin, why don’t you crawl back into that hole you’ve been hiding out in. Greenfield denies the truth of this “offer”. Were you this outraged when Obama actually stabbed Israel in the back at the end of his term? annoymous Jew, Obama didn’t stab israel in the back. He condemned settlement building. So did Rav Shach. This is good news. You can’t go forever in a stalemate. the cost to israel is incredible. The Pals likely will refuse the offer because it’s not 100% of arbitrary ceasefire borders. I’ll be curious to see not just what Abbas does but what the surveys of Pals say. It’s sad for the ones who would accept the deal, which is about 40% of them. Best thing to do is go out and have a drink before shabbos. Tryingtostaycalm, Hussein Obama stabbed Israel in the back with the “Iran deal”. And it’s none of Obama’s business where Jews build. I didn’t see him mixing in the the Fakestinians illegal building. Moderators Note: Sue us. Come on.